If your heating and cooling systems in Winter Haven, Florida are performing poorly, a home efficiency energy audit from Winter Haven Air Conditioning™ can help. For the most part, a home energy audit is a physical check. Our auditors thoroughly inspect your home’s walls, windows and doors for places where hot or cold air could be leaking into or out of the building, and they will check the insulation to see if it really can keep heat out. In addition, the energy audit includes an interview to identify any energy-wasting behaviors, such as leaving doors and windows open during the day or turning the thermostat unnecessarily low. How Do I Know If I Need an Energy Audit? If your heating and cooling systems in Winter Haven, Lakeland or Haines City, Florida are performing poorly, a home efficiency energy audit from Winter Haven Air Conditioning™ can help. At Winter Haven Air Conditioning™, we perform a complete energy audit for customers to help them reduce operating costs and be more comfortable. We invite you to contact us to discuss a home energy audit for your home in Dundee, Auburndale or Davenport at your convenience. When we perform a home efficiency audit, we focus on your entire house and not just a certain room or obvious problems, like heat loss through your windows. 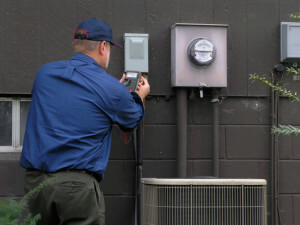 Our experienced service technicians use state-of-the-art equipment when performing your energy audit. The results of your home efficiency energy audit are computerized, and we then print the results for your reference. At Winter Haven Air Conditioning™, we will show you that a home energy audit is all about collecting information about your home energy use. You can help the auditor by collecting at least the past year’s worth of electric bills, so the auditor can easily analyze the main sources of energy loss in your home. In addition, take note of your typical thermostat setting and be prepared to answer questions about energy use in your home.